More than 1000 health professionals and medical workers rallied outside hospitals in Brisbane, Sydney, Darwin, Adelaide and Newcastle on 30 October to demand the release of children from detention. The demonstrations followed the stand by over 1000 doctors, nurses and medical workers, who rallied behind a “Detention Harms Children” banner at Melbourne’s Royal Children’s Hospital on 11 October. “We want to increase the pressure [on the Turnbull government]. And we won’t stop with this protest. We will make noise until the detention of children ends,” senior paediatrician Dr David Isaacs told The Guardian after the Sydney protest. While the medical workers have stopped short of saying that they won’t release children from the hospital to be taken to immigration detention (and potentially to Nauru), such defiance of the Immigration Department is being openly canvassed. The protests also followed the mass outrage across Australia that followed the government callously removing Abyan, the pregnant Somali refugee who was raped on Nauru. Abyan had been brought to Australia from Nauru late on Sunday 11 October, only to be removed from Australia on a specially chartered RAAF flight four days later, on the morning of 16 October. But if Malcolm Turnbull and Peter Dutton had had their way, Abyan would never have been brought to Australia. Raped, pregnant and requesting a termination of the pregnancy, the Australian government did nothing while Abyan’s options narrowed by the day and her desperation grew. It was not until Abyan’s plight became public and tens of thousands signed a petition and thousands of others sent emails and contacted MPs offices that the government moved to bring Abyan off Nauru. Her callous treatment in Australia was despicable. Abyan was sick; she was mentally exhausted. But the Immigration Department demanded that she jump to their timetable. Despite pleas for counsellors, and for her lawyer, in a desperate measure to get her away from any chance to review her treatment in a court, she was flown to the Solomon Islands—and then to Nauru. Peter Dutton detailed a list of supposed “interactions” Abyan had had with medical staff while she was in Sydney, but it has never been publicly released because it would not stand up to scrutiny. Abyan is insistent that she never saw a doctor and never saw a counsellor. Peter Dutton and Immigration bureaucrat, Border Force first assistant secretary for detention services, Neil Skill, took it upon themselves to get her out of the country, beyond the reach of lawyers or advocates on 16 October. But the outcry continued with angry protests in Sydney, Melbourne, Canberra and Brisbane. More thousands, disgusted with Malcolm Turnbull’s hypocrisy bombarded the offices of the Prime Minister and Immigration Minister. The Australian, with support from the Australian government, dispatched journalist Chris Kenny to do a job on Abyan. Peter Dutton had no problem collaborating in the violation of Abyan’s privacy. But despite doing his worst, even turning up to Abyan’s donga with Nauruan police, Kenny had to publish what Abyan had said all along, that she had never said that she would not have a termination. 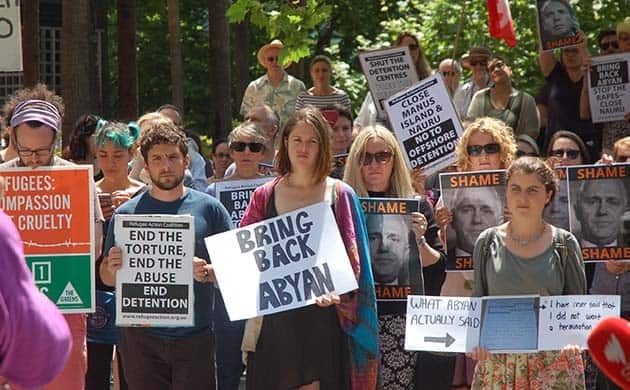 Amnesty International issued an urgent international action alert in support of Abyan; the UN’s High Commission for Human Rights also issued a statement calling on the Australian and Nauruan governments. Senior IHMS and Immigration officials were quickly sent to Nauru, and the young, pregnant, Somali refugee that they had so cruelly treated, was returned to Australia on 28 October. For over two months, the Australian government stalled—denying her even the most basic considerations or assistance to a victim of sexual assault. The facts speak for themselves. The government spent over $130,000 to get her out of the country and then another chartered flight to bring her back 13 days later. But the cost to Abyan, kept on Nauru, deprived of her choice, is incalculable. The extreme victimisation of Abyan is driven by the government’s determination to enforce offshore detention at all costs. Abyan was just collateral damage to a government increasingly obsessed with the militarisation of refugee policy. Against the odds, the refugee movement brought Abyan to Australia. Turnbull is not about to give up and a desperate government will continue to sanction the shocking abuses on Nauru; but the victory for Abyan tells us that with growing mobilisations, we can close Manus and Nauru and bring all the asylum seekers and refugees to Australia.